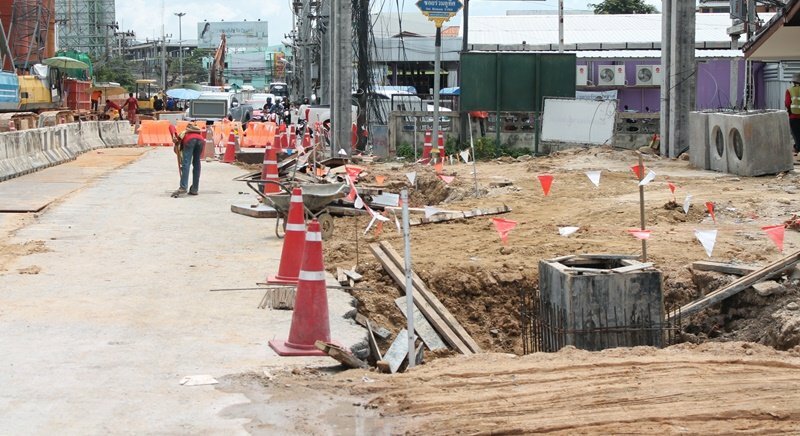 PHUKET: Construction of the Chalong Underpass can now move forward after the ongoing issue of land expropriation has settled between the Department of Highways and four land owners, a project engineer from the Department of Highways, Mr Somkiat Yimpong, confirmed yesterday (July 6). However, Mr Somkiat was unable to say the cost of the land expropriation. “There were (initially) 34 landowners who would in total were required to expropriate 900 metres of land. However, there were four land owners who could not agree on land expropriation covering 100m. “But that issue of the 100m has now been settled,” Mr Somkiat told The Phuket News’ sister publication Khao Phuket. The payment, to be complete this September, now sets the Chalong Underpass estimated time of completion to be in the next 14 months, said Mr Somkiat. “Construction is now at only 16% because the workers have not been able to work in that area,” he said. Mr Somkiat then went on to explain that the contractor would design a traffic deviation plan for Wiset Rd this month by creating one deviation way for both south and northbound traffic, and also for the repositioning of power poles and waterpipes. The contract for the B500 million project commenced on July 28, 2015, with a set deadline for September 14 this year.